Stress seems to come with the territory at work. Even if you love your job, there are still many causes of stress at work. Sometimes that stress takes the form of a tight deadline or a brief misunderstanding with a colleague. These things happen, and are considered part of the work life. But when stress becomes so bad that it makes you dread going to work, or the stress begins to affect your personal relationships and body health, it’s time to take a step back and figure out ways to deal with it. It all starts with figuring out the causes and then dealing with them, one at a time. Stress at work can be fleeting, or it might be chronic, with no end in sight. Here are some things that can lead to stress in your daily work. Taking on far too much, or being assigned an avalanche of work, can lead to burnout. Being overloaded with assignments, impossible deadlines, projects of immense magnitude or importance, and not having enough staff to help are nightmares. When you don’t have much control over your work life or much input in decisions, you might begin to feel helpless. That lack of control can lead you to feel as though the work is too much to handle, like you are simply a cog in the wheel and don’t have much worth to your supervisors. When work relationships are good, things are wonderful. One bad relationship, however, can spoil the entire day. Dealing with those who are 'out to get you' or don’t want to help you succeed – or don’t even want to pull their weight – can drag you down with them. It is one of the main causes of stress at work. When you feel as though your job is on the line and today might be the day you get fired, walking into the office becomes more of a struggle. Fearing the future job change, worrying about new management, and otherwise wondering how you will survive a downsizing can lead to serious stress and even depression. Do you feel like you work all the time and have no time for yourself? Do you miss your family and believe that you are just a paycheck to keep things rolling? Do you worry that your kids won’t know you? Losing a work-life balance can affect every part of your life. When you are handed a big assignment but not given the resources to help you complete it, you can feel adrift and lost. Receiving adequate training is crucial, and if you do not, you might get a bad review. But sometimes, getting that training is entirely out of your hands. Financial reward matters greatly, especially when dealing with a less-than-ideal situation at work. As prices go up, wages should go up too; but unfortunately, they might not. This can make you feel as though you are doing more work for less, which can be an awful place to be. The leader of the work can have a great influence on how employees handle themselves and their jobs. A boss who is constantly berating you, holding threats of firing over your head, or otherwise making you feel devalued can be one of the most serious causes of stress at work. Affirmation of the good things and constructive criticism for the not-so-good things are the key to helping employees grow. A job that never includes positive feedback means that you will eventually deal with wondering what comes next – that anxiety can make you feel awful about going to work. Big changes in the organizational structure can lead to shakeups all the way down to the bottom, which can mean jobs are lost, restructured, pay rates change, and workloads shift. Since you can’t control these changes and just have to deal with them, there is no doubt that they can make every workday stressful. Today’s world is so connected that it can be impossible to focus for an hour at a time. Phone calls, emails, and so many people pulling at your time – and demanding what they need right now – can actually reduce your productivity, leaving you wondering how you will get things all done. 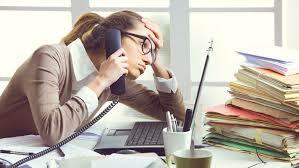 There are other problems that might be causes of stress at work, such as having insufficient skills, poor job performance, a job that doesn’t offer changes or promotions, poor physical working conditions, repetitive work, handling difficult clients, facing discrimination, dealing with a long commute, or fearing physical violence. Get very organized. Learn to keep lists, put things in various folders, and do large jobs based on several deadlines, so as to spread out the workload. Take care of yourself. Eat right, exercise, and take time to be alone. Spend time with family and friends in a way that has nothing to do with work, and resolve not to talk about it during that time. Never procrastinate. When you do, it only makes things worse a week or two later. Break up large tasks into small portions, and make sure you get a set amount done every day. Ask for help. If you simply cannot handle the workload anymore, tell your boss that you are at full capacity. Most should be understanding, especially if there are life circumstances that limit your time and efforts. Say no. Learning to say no means that you can say yes to the things that really matter to you and to your productivity. Don’t overcommit. Focus hard. Forget multi-tasking. If you are dealing with a project that requires your focus, look at only that, and don’t bother with outside influences, such as emails or other reports that need writing eventually. Delegate. The art of delegation can go a long way toward making everyone happy. You get to lessen some of the workload, and another colleague gets to prove himself. Talk to human resources. If you are dealing with harassment or discrimination, now is the time to go to HR to talk about the problem. You might be surprised to find you aren’t the only one with an issue. Be ready to take action. If the stress is becoming too much to handle, have a back-up plan for what you will do if you must leave your job. Get professional counseling. Speaking to someone about what is happening can help you put it all into perspective, and that can make you a better employee, as well as a happier person. Feeling Cold at Night, What Could It Be?